(NPR) - A high-ranking Orthodox priest has shocked Russian religious circles with sharp criticism of the church's highest authority. Archpriest Vsevolod Chaplin was sacked with little explanation on Thursday from his job as head of the church's department for cooperation for church and society. The Orthodox Holy Synod announced that Chaplin had been relieved of his duties, and that his department was disbanded. The statement said only that the step was taken to increase efficiency. It was a job that had given the 47-year-old religious conservative a national platform, from which he often made controversial statements about politics and public morals. Chaplin once urged women to dress more modestly so they wouldn't provoke rapes. He offended many of Russia's Muslims by characterizing Russia's military campaign in Syria as a "holy war" against extremists. After being sacked, Chaplin fired back in the media. 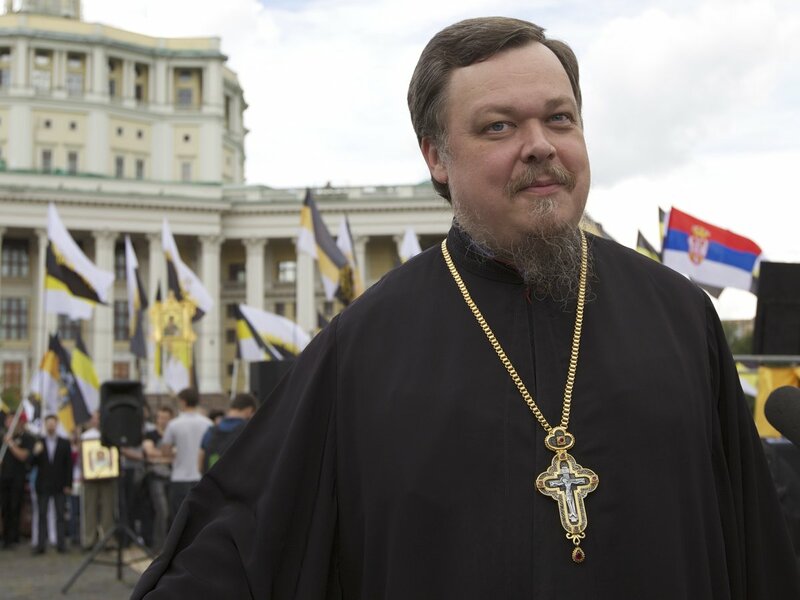 He told "Rain," a Russian Internet TV channel, that he was dismissed because the Moscow Patriarchate wanted to silence independent voices in the church. He said he had "seriously disagreed" with the church's highest authority, Patriarch Kirill, over the church's relationship with the Kremlin. Kirill is close to Russian President Vladimir Putin. He called on the church to condemn government corruption and resist seeking the favor of public officials. Until now, Chaplin has been much better known as a defender of the patriarch than as a critic. Kirill suffered a major embarrassment in 2012, when an official photograph showed him wearing a Breguet watch worth at least $30,000. The photograph was later altered to cover up the luxury timepiece, but the watch was still visible as a reflection on the patriarch's polished table. At the time, Chaplin dismissed the incident as idle attention from the media. He was far more critical of Kirill and Russia's ruling establishment in a news conference after his dismissal on Friday, in which he railed that "immoral elites are hampering the nation's development." He told reporters that Russia faces "inevitable catastrophe" unless the leadership allows public discussion. In another interview, Chaplin said he had disagreed with the patriarch about the war in eastern Ukraine, saying that the Russian government and the church should have given even stronger support to pro-Russian separatists there. Chaplin has been an outspoken critic of what he's characterized as the moral degeneracy of the West. Referring to the invasions by Napoleon and Hitler, he has said that Russians have often given their lives to stop "all global projects that disagreed with our conscience, with our vision of history and, I would say, with God's own truth." Chaplin's vision of the West is an apocalyptic one. He presented it in a ranting e-novella called "Machaut and the Bears," set in the year 2043. In a breakneck stream-of-consciousness style, the book seems to portray the destruction of Moscow, apparently by gays, Islamists and Ukrainian fascists. It was revealed last February that Chaplin had written the work under a pen name. He may have more time for literary pursuits in the future. Part of the Western narrative to feebly try to spark civil war in the Russian Orthodox church. Chaplain rose with +Patriarch Kirill and was undone with the traditionalist swing in play. Look for +Hilarion (Alfeev) to be demoted soon. We need Fr. Vsevolod to come join us in Rome and give our hierarchs some backbone. I, as always, will trust nothing that comes from the western media. They will spin this and seemingly have spun this into something that it's not. After Patriarch Kirill, Metropolitan Hilarion is the most visible member of the ROC. I claim to be no expert on the subject but if he gets demoted that would shock me. It's hard to keep up with all of the political maneuvering. +Metropolitan Hilarion is the most visible but not the second by any means. The Metropolitan of St. Petersburg is more important, for instance. With the recent consecration of +Bishop Tikhon (Shevkunov), what people like +Hilarion represent is being broadcast as out of vogue. When +Hilarion's shtick is found by the people and the powers that be to be objectionable, he may even be retired. His participation in the EP's Council and his coziness with Rome once popularly known will cause the backlash which gets him sacked. So, yes, his orientation is seen as useful in bridge building, but his actual work is his albatross and what he has said abroad and the episcopacy of elitism and luxury he stands for are no guarantees of permanence or even continuance. You see there will be an uproar against certain initiatives, initiatives he will assume all of the blame for. As an opponent of this hierarch, I am happy he is where he is.